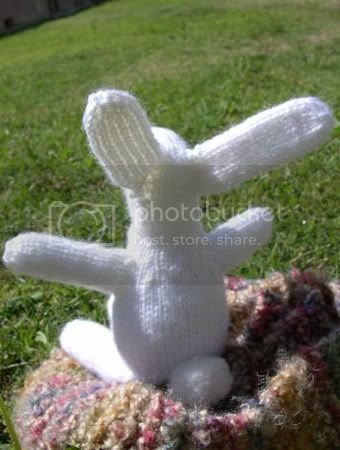 Here's a little bunny I knitted up a few weeks ago. It's my first attempt at a stuffed animal, though I did do those little snowmen ornaments a while back. But they were pretty basic, and besides snowmen aren't animals. 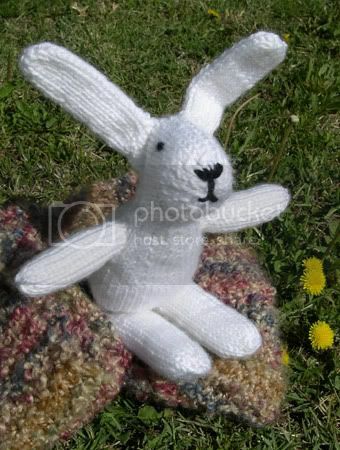 I used this pattern: Mr. Bunny. My Mr. Bunny doesn't look quite like the original (he didn't end up quite as fat) but I think he's pretty cute. I just used a plain cheap white yarn to knit him so he's not really fuzzy. The hardest part was knitting his head and neck, which is knit like a sock (which I've never done either). When I tried to knit the ears according to the instructions I must have done them wrong because the sides kept rolling up - they wouldn't lie flat. So I ended up knitting them as a long thin tube instead. Also, we've finally moved out of our apartment and are in our new house! We haven't had any major problems yet. I'm still busy trying to put things away and empty boxes. How cute!!!! I love it! !